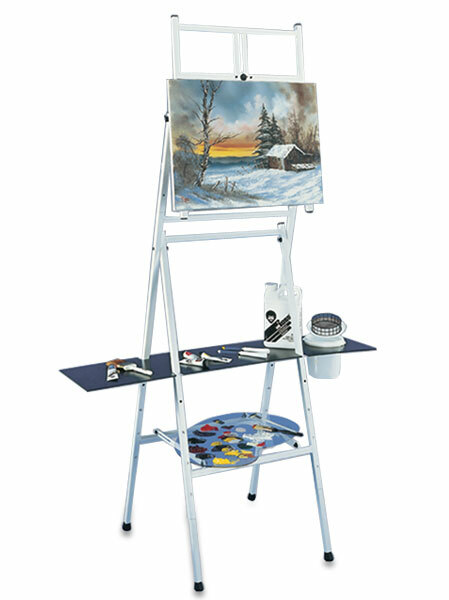 Designed to Bob's personal specification, this is the easel which you see him using on TV. It is constructed of metal to give rock-solid stability for life-time studio use. The top half can be detached for table-top use, it is complete with working shelf with bucket aperture. Bob Ross Cleaning Bucket & Screen sold separately. This easel can only be shipped within the UK. A very solid metal easel. There is no wobble when painting and the canvas is held in place by four sharp spikes so it does not move at all. There is some self assembly required but nothing too difficult and no tools required (an allen key comes with it). It took me about 15 minutes to get it together. The top part lifts off if you want a table top easel and it is light enough to be moved around quite easily, but its bulk means it is easier with two people. The shelf is really handy although the hole in it is only of use if you have the Bob Ross bucket to go in it.